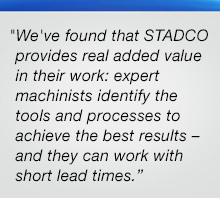 STADCO Precision supplies the world's most innovative companies with mission-critical, precision machined components that meet their demands for quality, reproducibility, lead time and price. Our mission is to help you be more agile, more productive, and more profitable. STADCO produces precision machined components using Davenport, Acme and Tornos multiple-spindle bar milling and turning machines, Escomatic Swiss screw machines and CNC tapping centers. Our quality system is ISO 9001:2015 certified. All STADCO machine operators are expert with SPC. We also have a longstanding commitment to sustainability. For STADCO customers, this means that raw material has been purchased to minimize transport, that processes are in place to keep quality high and scrap exceptionally low, and that, at each step, handling and wait times have been streamlined. As a result, we can be both good stewards of the environment and the supplier with the shortest lead times. STADCO: High volumes of precision machined components with individual component accuracy.